Smart cities start with a smart public infrastructure to deliver clean water, dependable power, safe gas, and efficient public lighting. And as they free up resources by intelligently delivering essential services, they are able to invest in other services to improve quality of life. The main reason behind the growth of smart cities is the need for effective solution for managing the cities. Driving factors responsible for IoT market include increasing demand for intelligent cities, connected devices and also the rising demand for Internet of Things (IoT) devices. But the explosive growth of Smart City and Internet of Things applications creates many scientific and engineering challenges that call for ingenious research efforts from both academia and industry, especially for the development of efficient, scalable, and reliable Smart City based on IoT. New protocols, architectures, and services are in dire needs to respond for these challenges. Maximize Market Research has comprehensively analyzed Global IoT Market Size for Smart Cities emphasizing on each and every aspect of the infrastructure that turns an ordinary city into a ‘smart’ one. The driving forces, as well as considerable restraints, have been explained in depth to attain a balanced scenario. Segment wise Global IoT Market Size for Smart Cities size and Global IoT Market Size for Smart Cities share during the forecast years are duly addressed to portray the probable picture of this exuberant industry. The competitive landscape comprising of key innovators, service providers, market giants as well as niche players is studied and analyzed extensively with respect to their strengths, weaknesses as well as value addition prospects. The report presents significant case studies along with the success stories to motivate and guide the like minds. In addition, Report displays current consolidation trends with respect to prominent mergers and acquisitions, consequent Market fragmentation, new trends and dynamics in partnerships, emerging business models. This will enable the reader to comprehend whole IoT Ecosystem with utmost ease and clarity. 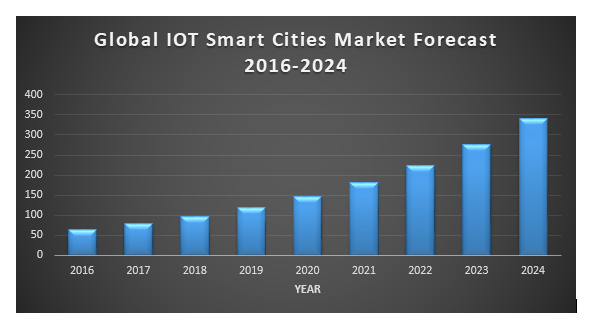 Click the link to read the report description and Table of Content of the Global IoT Market for Smart Cities Analysis and Forecast 2024.